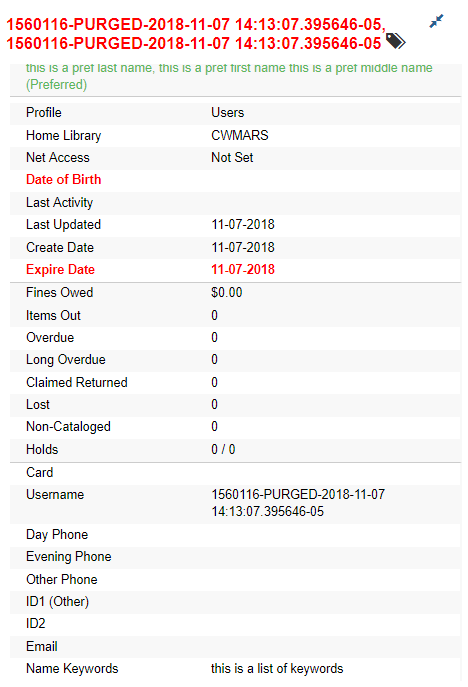 When choosing the option to "Completely Purge Account", any preferred names or name keywords attached to the patron continue to exist in the database. Is there any reason to not anonymize these like the rest of the fields on the account when it is purged? I've attached a screenshot of the deleted record pulled up in the web client, (via database ID). Notice the purged status of the account and the how the preferred names and keywords persist. I have pushed a branch that fixes this for master/3.3: user/dyrcona/lp1802166-purge-preferred-names in the working repository. I had made a branch for 3.2, but realized that backporting this fix is dangerous because there are other changes to the actor.usr_delete function between rel_3_2 and master. If the rel_3_2 function and the master function have the same upgrade number, then someone could update their 3.2 installation and miss getting the new features of actor.usr_delete when upgrading to 3.3 or beyond later. I added another commit to set name_keywords to NULL, so you want the top two commits on the branch.